SCAPE Studio won an international design competition for the Town Branch Commons project in 2012. Town Branch Park was envisioned as the heart of Town Branch Commons. 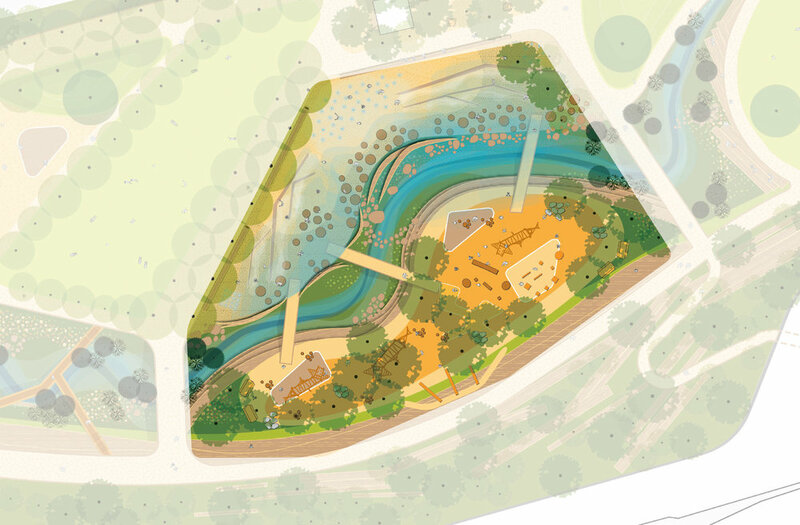 SCAPE understood the cultural and ecological significance Town Branch Creek held for our city and the design they proposed both honored and reflected that history. Lexington was founded along the banks of Town Branch, which was once described as a "magnificent stream . . .whose green banks were hemmed with the brightest flowers." Today, Town Branch is a hidden waterway buried deep beneath roadways and parking lots through most of the city. By peeling away these layers of concrete and blacktop in what is today Manchester Street parking lot, Town Branch Park will expose and restore the stream bed and a piece of our history. Building upon SCAPE’s award winning design concept with a thoughtful programming plan and governance structure, Town Branch Park will enhance the quality of life in Lexington and nurture the health and well-being of our people, the entire community, the environment, and our economy. SCAPE is a landscape architecture and urban design studio based in New York City that works to create positive change in communities. Kate Orff, SCAPE’s founder and lead designer, was recently named a 2017 MacArthur Fellow (“Genius Award”) in large part due to her work in Lexington. She is the first landscape architect to win this prestigious award.